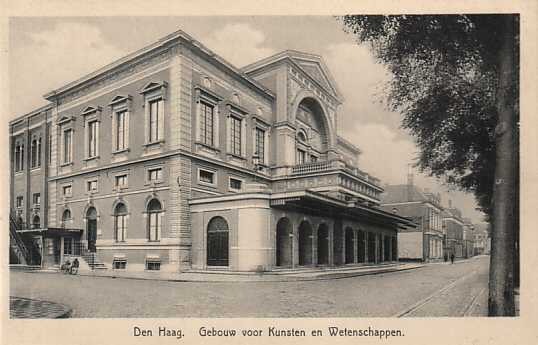 Concert hall, built 1874 by Verschoor and E. Gugel. Various rebuildings. Used for concerts and theatre performances. Destroyed by a fire on 18 Dec 1964. Remains subsequently demolished. Originally 2200 seats, 1964: 1700 seats. Front Text: "Den Haag, Gebouw voor Kunsten en Wetenschappen"